It’s been a difficult year for conducting prescribed fires so far – the wind seems to be blowing even harder and more consistently than in recent memory. And that’s saying something, living in the Great Plains. A couple of weeks ago, we were able to pull off one prairie management burn here in the Platte River Prairies. The fire went well, and this week I took a quick walk through the burned area to see how the regrowth of vegetation was coming along. It’s been a cold and dry spring, following a dry fall and winter, so plant growth has been slow, but things are finally starting to kick in. Within the burned area, many plant species are a little behind their compatriots growing outside the burned area, but others are ahead. Those that are behind are the species that were already starting to grow when the fire came through – those species had to start again, so are behind schedule. The species that are further ahead in the burned area are those that are taking advantage of the warmer soil and have either germinated or emerged faster than those in the cooler soil of unburned areas. Regrowth in sand prairie burned a couple weeks ago. The wildflower in the foreground is shell-leaf penstemon (Penstemon grandflorus). Regardless, plants are growing well in the burned area. That’s good, because cattle will arrive within the next week or so, and we want the burned area to be particularly attractive to those grazers. One of the major objectives of our fire was to concentrate grazing in one portion (the burned patch) of the prairie this season, leaving the remainder of the pasture with much less intensive grazing. Hopefully, the result will support our efforts to create a variety of habitat patches across our prairies, and to shift the location of those patches from place to place each year. Burning a different patch of prairie each year helps ensure that a mixture of habitat types is always available and most or all wildlife and invertebrate species can find the habitat they need. Our prairies usually have a patch of very short habitat, several patches in some stage of recovery from intensive grazing, and some areas that are tall and very lightly grazed – or ungrazed. Some animals will follow those habitat patches across the landscape. Others will go through boom and bust periods within one portion of a prairie, depending upon what conditions they thrive best under. Because we’re always changing the location of habitat patches, plant species also experience changing conditions from year to year. This means that some species flourish one year, but may have to wait a few years before those favored conditions return. In the meantime, other plant species will find success. Constantly changing conditions help ensure that no group of species becomes too dominant, but that all species can survive and maintain a place in the plant community. Our long-term data has shown the our plant communities have stable to increasing plant diversity under this kind of management, and we’re not seeing any plant species disappear. 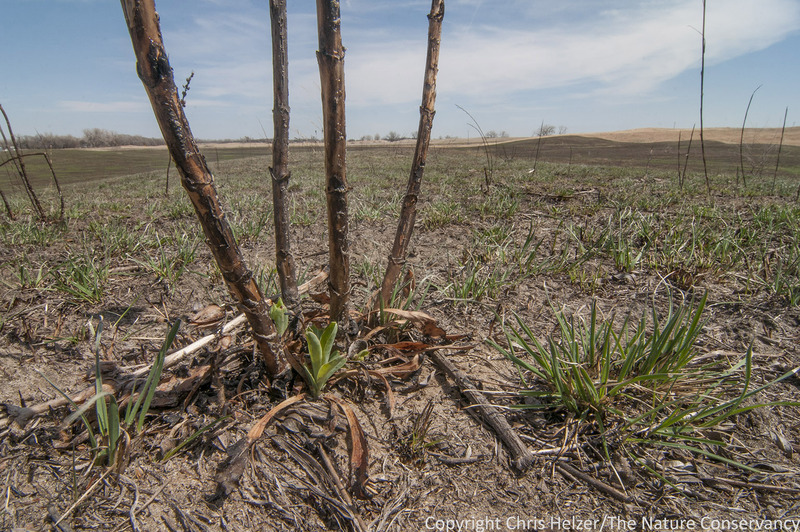 This burned patch makes up between a third and a fourth of a 110 acre management unit in our Platte River Prairies. Burning only a portion of each unit each year helps ensure good wildlife habitat and changing growth conditions for plants, but also helps avoid catastrophic impacts on species vulnerable to fire. Another benefit of burning only a portion of our prairies each year is that it helps us avoid catastrophic impacts on plant and animal species that are negatively impacted by fire. Invertebrates that overwinter above ground, for example, can be destroyed by an early season fire. Growing season fires can kill animals (invertebrates and vertebrates) that are unable to escape by leaving the area or retreating underground. These kinds of impacts are somewhat unavoidable, regardless of the season of fire, but by burning only a portion of our prairies, we can try to restrict impacts to a relatively small proportion of the population of each species, allowing the majority of individuals to survive and recolonize the burned patch over time. 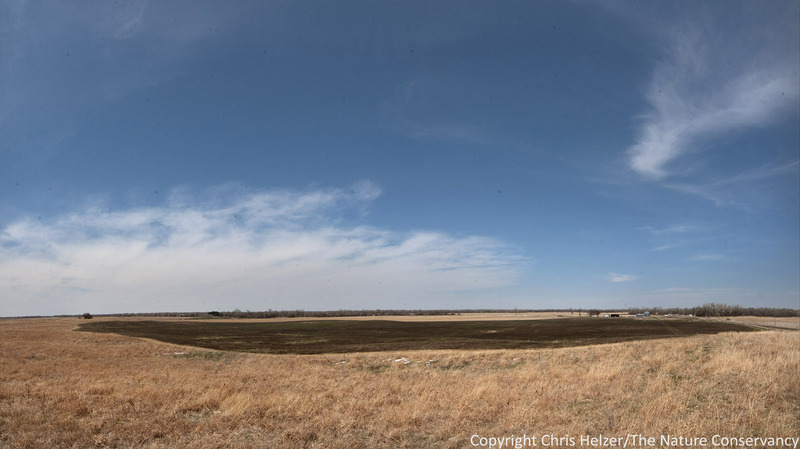 Burning an entire prairie, especially in highly fragmented landscapes in which recolonization is unlikely, can result in completely and permanently obliterating vulnerable species from a site. Hopefully, the wind will pause a few times during the remainder of the spring, and we’ll create a few more burned patches in our prairies. If not, we’ll try to create patches of short habitat by haying or by temporarily fencing cattle into an area to knock vegetation height down. We’ve found that all three methods (burning, haying, temporary enclosures) can create a patch that attracts livestock grazing afterward – and therefore pulls that grazing off of other portions of prairie. There are lots of ways to create patchy habitats, and none are necessarily best. As long as there is always a mixture of habitat types across our sites, we feel pretty good about our management. Hopefully, the species living in our prairies feel pretty good about that management too.